My place will never be immaculate. As long as I have long hair, it will fall off of me and wrap around every piece of fuzz and create pernicious dustballs. However, the place can be organized. One of the great things about being underemployed is being able to really attack the mini-shameholes in this place. I live in 700-ish square feet. It’s a good amount of space for one person, but I have a grown-up lady amount of stuff including a full kitchen, set of tools and hobby equipment, multiple computers and laptops, ample book collection, and a guest bed. As much as I like to keep things in order, I’m not going for the minimalist aesthetic. At the same time, clutter clouds my mind, pulls away little parts of my attention that I could spend working or bird watching. So, every few days I pick a little part of the apartment that has been “silting in” as we say in my family, and take it apart and put it back together again somewhat improved. This week that included putting up a shelf in my kitchen that I’ve been meaning to do for about seven years. 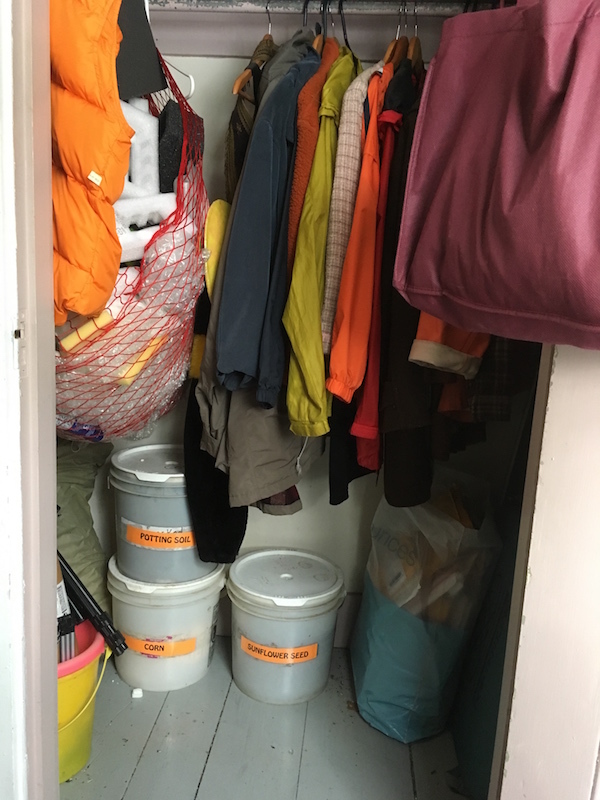 Yesterday it was emptying and refilling the hall closet, the one that is storage for coats, mailing envelopes and packing material, window screens and storm windows, tents, tripods, houseplant equipment, and birdseed. Along the way there are assessments to make. Are you ever going to wear your seventh favorite scarf? Can you justify needing three separate tripods when you used your camera maybe three times last year? Does a raincoat need to spark joy, or is it okay if it just functions as a raincoat and you live where it rains? Tough questions. I’ve been swapping messages with an online friend who works as a professional organizer and she’s sent me links to a lot of interesting critiques of the recently faddish Kon Mari “magic tidying” approach which has been my latest hobby reading. I’m a big fan of “What works for you.” but we all know that “My way or the highway!” approaches sell more books. Ultimately while having a tidy closet will save me a little bit of time and a little bit of hassle, the glowing accomplishment of an offline project well done from start to finish (and an excuse to use the labelmaker) was the true reward here. Who is your online friend? I want to hire her! I am, indeed, quite dull.